The sense of arrival is profound as you cast your eyes on the dramatic clubhouse awaiting, just inside the gates of the Lakewood Ranch Country Club Village. Such an inspired welcome beckons as the clubhouse rises above the horizon to greet you with magnificent style. Verdant fairways invite you to come play. Along these stretches of green, dazzling custom homes reflect a lifestyle that is casual, comfortable and private. You can belong and yet, not live here. This is a place in life you’ve earned. Indeed, you have arrived. 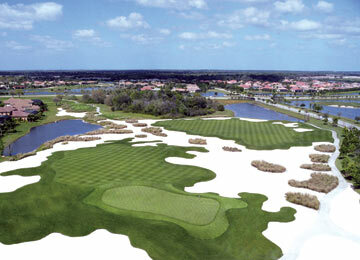 Lakewood Ranch Golf & Country Club offers its members 3 unique and challenging championship golf courses. Each provides players with a variety of skill levels through length, bunker and water placement, forced carries and overall design. Offering many sets of tee boxes, the courses can be challenged by many different skill levels. As a member you have the privilege to play all 54 holes, Cypress Links, King’s Dunes and Royal Lakes. They are all part of the private Lakewood Ranch Golf and Country Club. 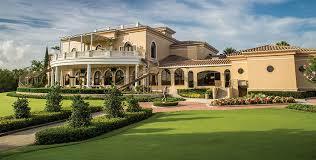 The private Clubhouse opened on November 29, 2001 with the Cypress Links course. The King’s Dunes course was opened in 2005 and Royal Lakes in 2007, which gives members 54 holes as part of their private club membership. We have the youngest membership in the area with an average age of about 57. Royal Lakes and Cypress Links were designed with all skill levels in mind, yet both can provide a challenge for skilled players measuring 7,339 and 7,141 yards respectively. Royal Lakes can also be very enjoyable for novice players using the Par 3 tees measuring 1,800 yards. Every hole can be played as a Par 3 and it’s a great way to introduce golf to any member of the family, young or old. With the luxury of 3 pristine golf courses you have the unique opportunity to play some of the most exciting and well manicured courses in the area.